A selection of must-have apps for your mobile devices. Wisdom Wednesday – Wall or Bridge? Enter your email address to subscribe to my website and receive notifications of new posts by email. A selection of Texture Sets are available for your 3D models. Do you need a plugin to help you create a Child Theme? Need a backup of your entire WordPress site? This and more can be answered by The WP Guru. © Travelling Banana. Unauthorized use and/or duplication of this material without express and written permission from this blog’s author and/or owner is strictly prohibited. Excerpts and links may be used, provided that full and clear credit is given to Travelling Banana with appropriate and specific direction to the original content. From time-to-time in the relative calm of Miami Beach you will suddenly hear raging squawks that sound a bit like hysterical laughter. Looking up you will see three or four green birds flying above. Yes, they even “talk” noisily during flight. Occasionally you will see them sitting quietly together on overhead wires but they can’t keep quiet for very long. I guess they have a lot to say and want to tell everyone and anyone who will listen how super happy they are. Why wouldn’t they be…they live in Miami. I’ve been calling them wild green parrots for a while but I have recently found out that they actually called Mitred Parakeets. I’ve been referring to them as wild green parrots as they are considered feral but I like my description better. They were imported into the U.S. in vast quantities, around 140,000 birds, from South America in the 1980’s. They settled in New York, Los Angeles and Miami and can still be seen in those areas today. Have they migrated anywhere else? 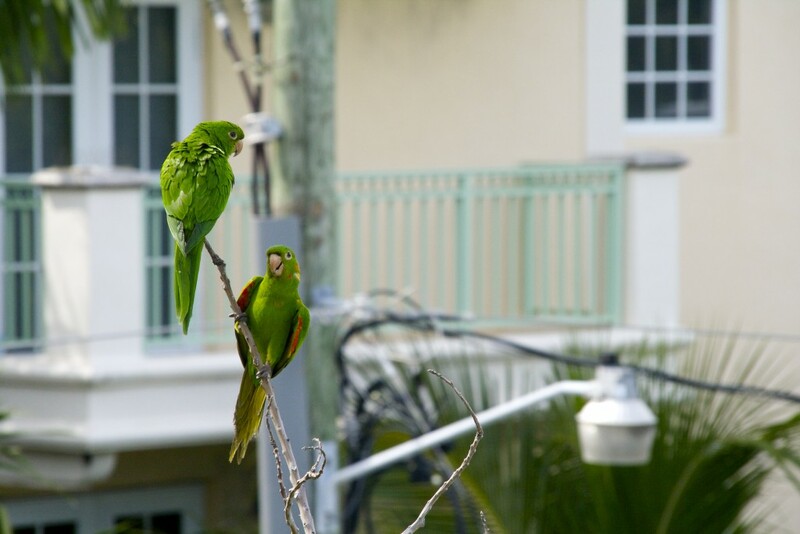 Have you spotted any Mitred Parakeets in your neighborhood? Two Mitred Parakeets chilling out together but keeping a beady eye on me. I managed to take quite a few close-ups and they seemed to be interested in what I was doing! They are such pretty birds but extremely loud for their size which can be quite a surprise. You definitely hear them before you see them! 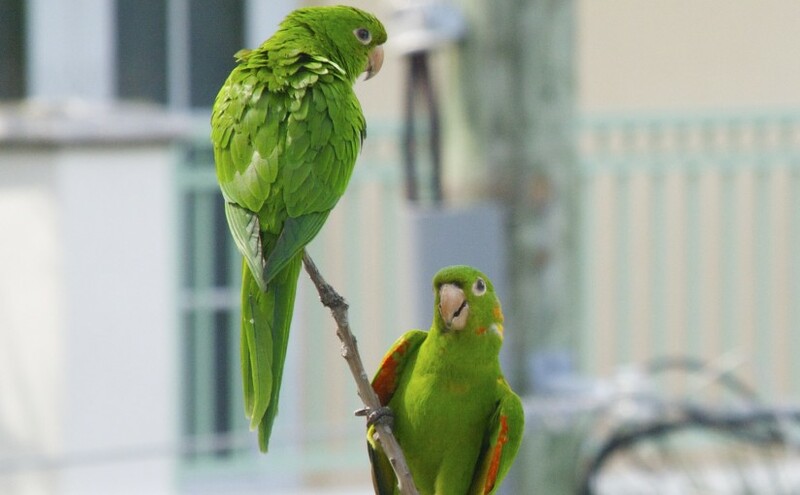 Their feathers are bright tropical green with patches of red and occasional yellow flecks. They are nosy and social birds as you can generally spot them in pairs or small groups. They tend to disappear around November time and return Feb/March. I’m not sure where they go during that time but it’s nice to have them back. Great pictures of the parrots! Thank you for your kind words and for visiting. I saw some in downtown Miami by the water the other day! I’ve also seen them in St. Pete’s Beach! Glad you’ve had chance to spot our feathery friends. I’m in Fort Lauderdale. Sitting on my balcony I just witnessed a huge flock sitting in the palm trees then taking flight again. Very loud but quite pretty. saw 2 yesterday near the lowes hotel in Miami. They are fun. Thanks for sharing and stopping by. Great pics of some fascinating birds…The ones in your photos are white-eyed parakeets, a relative of the mitred parakeet. They are now the most numerous ‘conure’ on South Beach. Several years ago, there were lots of blue-crowned parakeets on Miami Beach- the bottom mandible is black- the only local parakeet that shows this. White-eyes are much more common now. By the way, there are huge numbers of mitreds around Dadeland and at Sweetwater. I took some videos of a group airborne one early morning that must have been over a thousand. Possibly the greatest bird spectacle in my 24 years in Miami. The sound, clustering of several groups merging, seperating, and simply enjoying themselves was great! Thanks for the valuable information and your input – much appreciated. Wow that flock you saw must have been impressive and extremely loud. Thanks for stopping by and happy birdwatching. I live in Miami Shores, which is located across the intracoastal com the North Beach area. Every day dozens of these parrots hang out in the trees outside my condo. They are extremely loud, and they do “talk” to each other constantly; sometimes I swear they are having arguments. I work from home sometimes and it drove me crazy at first, but now I’m quite used to it. They disappeared for a few months, and I kind of missed them, but now they are back. This morning my wife and I were on the deck enjoying the New Year’s winter weather with a coffee, when a very noisy, green flock flew by just a short distance away. They certainly sounded very happy. I love watching birds, and knew I was seeing something special, I quickly grabbed the binoculars which are always within reach. I was thrilled to see them for the first time, in this, our second year in Hallandale Beach. I Googled ‘are green parrots native to Miami’, and your page and photos popped up. Now you know that one of the green groups also gets to Hallandale sometimes, and it was a pleasure to see them. Thank you for telling your story. I’m so pleased they came to visit you whilst you are down here. You certainly can’t miss them they have a lot to say but they look like they have a lot of fun. They’ve not quite moved back here yet. I have lived in Fort Lauderdale on a lake for only a year. However within the last few days I have seen these huge flocks (probably 100) or more) of what looks like green parrots in the sky. You can’t help noticing them because they are so noisy! Even though they are so noisy; they are fascinating and beautiful to see even if only flying by! I Googled to try to figure out what I was seeing which brought me to your page! Has anyone else seen these birds in huge flocks as I have? Thank you for your comment. How interesting. I’ve not seen a flock of green parrots that large before here in Miami. They’re usually in smaller groups (pairs, sometimes three or four) That’s usually loud enough so 100 or so would have been so noisy. They’re not here yet so many they’re getting ready to visit us already. I’ll be interested to hear if anyone else spots these large flocks and whether they are moving down the state already in search of warmer weather. Hi. Four of these birds have been around my building the last week. I am in mid beach at 31 street. Beautiful and loud. Fabulous thanks for letting me know – it’s always fascinating to track them around Miami. They’re are quite a lot of our feathered friends flying and talking down here. There is a huge flock (around 100) of them currently roosting in front of my condo 6039 Collins, Miami Beach. We recently hosted a parrot party where the guests brought binoculars to enjoy the fascinating show!! They are very fun neighbors!! Wow thanks for sharing. I’m always fascinated where they go. We have zero now down here in Miami Beach. We won’t see them again until February time. Together we are tracking where our little green friends move around to. I should make a parrot map and everyone can add where they are at any particular point in the year. Parrot Party – now that sounds fun. 100 of them must have been extremely noisy. First of all I would like to say wonderful blog! I had a quick question that I’d like to ask if you do not mind. I was curious to know how you center yourself and clear your head before writing. I’ve had difficulty clearing my thoughts in getting my ideas out there. I do enjoy writing but it just seems like the first 10 to 15 minutes are usually lost just trying to figure out how to begin. Any recommendations or hints? Appreciate it! Thank you for stopping by. I haven’t done a lot of writing recently as we’ve had a number of major life events but thanks for the question. All I can say is it is much easier to write about things you enjoy and that inspire you. You will naturally want to spend the time writing about what you love and will have no trouble focusing on your work. Finding a quiet spot or planning time in your diary is useful. Treat it like any appointment- you don’t want to be late or let that person down – why would you let yourself down or keep postponing the meeting? Tackle your writing as an important meeting. Set a time when you know you’re not going to be disturbed. You can also set a timer so you only write for a certain amount of time. There are apps that can help you with that too. I hope your creative juices start to flow and your fingers fly across the keyboard. Once you start and find a routine that works for you you’ll be on a roll. Our first time visiting Miami this week. My wife and I were out for a walk near North Beach Band Shell when I heard the first one. I knew it sounded different so stopped to find the source. Within minutes, I counted 5 of these beautiful green birds. Even the locals stopped and watched.